Means “student” in French. Our aim is to provide students with an opportunity to “ELEVEate” themselves through education to reach their potential. ELEVEate is a non-profit organization based in the United States. It is working to improve the well-being of girls by providing them with greater access to education and training, and personal development. 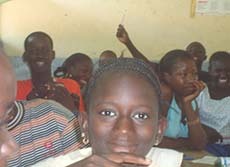 Our current emphasis is on teenage girls residing in the Kaolack region of the Republic of Senegal. The challenges these girls face are ones girls confront in many nations on the African continent. Ultimately, ELEVEate plans to expand its activities to help girls in other locations in Africa. ELEVEate is dedicated to promoting the education of youths in developing countries by providing charitable contributions and grants. ELEVEate is committed to advancing opportunities for learning, including greater access to education and training, and personal development. ELEVEate’s vision is a world in which every girl is able to acquire the skills needed to pursue her dreams and to develop a strong sense of dignity, self-efficacy, and self-esteem. In the summer of 2007, Allyson Goldsmith worked as in intern with an NGO in Kaolack Senegal, and found that very few girls were attending secondary school because they were unregistered without a birth certificate. Acquiring a birth certificate costs 25 USD. With most families living on less than 2 USD a day and other family needs given higher priority, female children remain unregistered. Moved by this harsh reality, Allyson began to raise funds to address this situation. Within a year she was able to raise enough money to purchase birth certificates for 172 girls in the Kaolack region. Her vision to unlock the dreams of more girls by providing them with birth certificates led to the formation of ELEVEate.